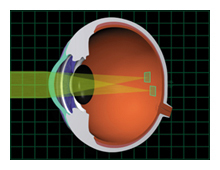 Enhanced clarity and quality of uncorrected distance vision. The AcrySof Toric lens is ideal for patients who wish to be corrected for distance vision and are comfortable wearing glasses. Because this lens does not offer the ability to accommodate or adjust one’s vision to varying distances, glasses would be required for near and intermediate tasks for people who have this implant. The AcrySof Toric lens implant is also an excellent choice for those who drive a lot at night, as it delivers great clarity with minimal reports of glare or haloes under both bright and dim lighting conditions. Whether myopic or hyperopic, most eyes have corneal astigmatism to some degree. 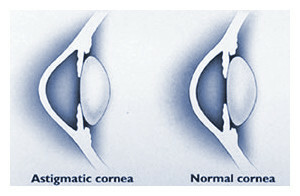 Corneal astigmatism means that the front part of your eye, the clear window you look through, is not perfectly round. Instead of being spherical like a basketball, an astigmatic cornea is slightly flattened, more oval in shape like a football, with one side steeper than the other (as illustrated above). Because the astigmatic cornea is curved more (steeper) in one direction than the other, light entering the eye is refracted differently as it passes through these different areas. This causes light to come into focus at several different points on the back of the eye, rather than ideally coming into focus at just one point (note the illustration, right). corneal astigmatism of the human eye. The AcrySof Toric intraocular lens is designed to have the lens capsule “shrink wrap” around it. This helps the lens stay stable and centered within the eye. to the structure of the acrylic material. (i.e., natural yellowing) of a healthy adult crystalline lens, without a negative impact on color perception. (i.e., Nd:YAG laser treatment), if required.